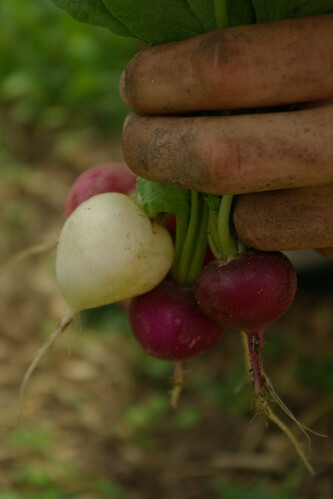 Fresh Radishes ready to be added to an early spring salad! Growing your own food is very fun and exciting, and perhaps one of the most gratifying tasks one can take on. I am going to share with you the five main reasons why this simple, yet uncommon act is so special. First of all, there is a popular misconception that needs to be brought to the surface — the idea that to grow food you must wear overalls, drive a tractor, and drink moonshine. This is our cultural image of a ‘farmer’, and however false it may be, it brings up the point that everyone has the ability to grow SOME of their own food, whether you’re a student, full time worker, or stay-at-home mom. It is NOT all-or-nothing ; you can make it as simple or as complex as you’d like, all the way from growing a single tomato plant on your patio to installing a backyard apple orchard. Food that is grown and harvested at home is the freshest food you’ll ever get. It has not traveled halfway across the world, but instead halfway across your yard. When you cut a head of lettuce from the stem, essentially you’re killing that part of the plant. The enzymes, vitamins, and minerals, only stay present for so long once the vegetable is ‘dead’, therefore the sooner you can eat it the more lively and nutrient dense it will be. Lettuce harvested from my garden will last 2 weeks in the refrigerator; lettuce purchased from the supermarket will last only a few days. Why? Because it was picked several days prior, then packaged and shipped…all of this amounts to a product that is already days, if not weeks old. Fresh is best. Do you ever wonder how the food on your plate was produced? Was it sprayed with dangerous toxins, such as herbicides, pesticides, or fungicides? Unfortunately, more than not the answer is yes. Some adverse health effects linked to pesticides usage include: cancer, nerve and brain damage, and hormonal imbalances. Children tend to be the most prone to these symptoms. Producing your own food allows you to be sure that it is not chemical laden and jeopardizing your family’s health. 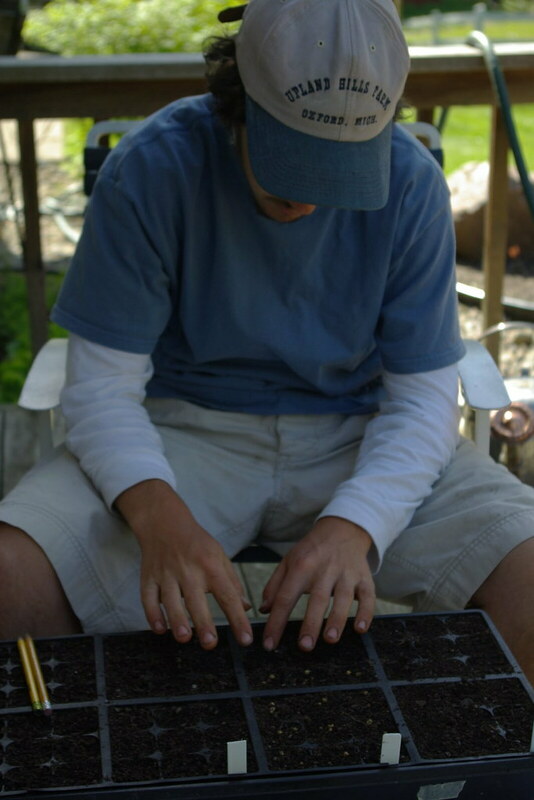 The author planting seeds in a tray which will later be transplanted into the garden. A very easy yet satisfying experience- great for kids and adults! The average grocery store tomato travels over 10,000 miles before it reaches you. For that reason, it is picked unripe, then sprayed with ethylene gas to unnaturally ripen it! Is all of that traveling necessary? We talk about climate change as a result of an overabundance of carbon emissions from burning gasoline, well Mr. Tomato is guilty and so are you. Industrial agriculture pollutes the air, water, and soil in more ways than one. A build-up of dangerous agrochemicals is wreaking havoc on our biosphere. Do you really want to support this destructive system? Install a small garden, grow some of your own vegetables, and you can begin to bypass this filthiness altogether! I recently had a friend tell me she was disappointed that healthy food was so expensive, yet the highly processed, unhealthy food was cheap and affordable. This is arguable, but for now I will resist and simply proclaim that by growing your own food(veggies,fruits,nuts,berries,grains, eggs, meat,etc.) you inevitably save money. Our 1,200 sq. foot garden provides a generous amount of fresh food throughout the summer and even enough to preserve for winter in the form of tomato sauce, pickles, etc., because of that my family saves hundreds of dollars each year. This requires as little as 1-3 hours of work per week. The idea that growing produce is a grueling and time-consuming task is rather deceptive. Garden Strawberries posses a flavor far superior to anything found in the stores. In the past 50-100 years we have become more distant from nature than we have ever been throughout human history. When children are asked to name a single indigenous plant they are speechless, yet they are able to recognize over 150 corporate logos. We know precisely how to operate our blackberry cell-phones but when asked how does a blackberry grow, most would be dumbfounded; ‘Ugh..does it grow on a tree, or a vine..oo doesn’t it grow underground or something! ?’Are we boarding the millennium falcon? Its as if humans have been living in a technofanatical dream, and now the alarm is ringing. Don’t press the sleep button anymore. Gardening is perhaps one of the most awakening ways to reconnect with the natural world which we have unwittingly separated ourselves from. Garden fresh ingrediants make for a wonderful time in the kitchen and many good meals to be enjoyed with friends & family! I happily foresee a world where gardening and growing food is the ‘cool and trendy’ thing to do. This isn’t far off. As a young adult I feel it is especially necessary for the youth to take action now.We’ve shattered the taboo of what it means to grow food, so now we can make some bigger steps towards a more healthy and regenerative culture! I hope that this article planted a seed inside of you… with plenty of TLC that idea will germinate and spring forth a life of joyfulness and bounty. Like always, please share your thoughts!